The drunken driver of a black fifth-gen Camaro wreaked havoc on the New York State Thruway last Tuesday, colliding into two vehicles on I-90 in Batavia, New York, on April 21st. Fortunately, none of the motorists were injured (even though the a-hole in the Camaro might have deserved to be). The whole incident was captured on video by YouTube user Tim Linton, who says in the video that he had just purchased his vehicle’s dash cam recently—but man, has he already mastered it! Unlike some dull, silent dash cam videos, this one features an enlightening talk radio discussion about Philadelphia Eagles running back LeSean McCoy for the first two minutes. Then, around the 2:19 mark, Linton gets a phone call from his good friend Mr. Jacobs, and that is when the proverbial sh@# Mirai fuel hits the fan. The Camaro driver, peeved that he is stuck behind the tanker and the work truck, decides he will pass on the shoulder of the road (and even uses his left turn signal to politely indicate the illegal move he’s about to make). 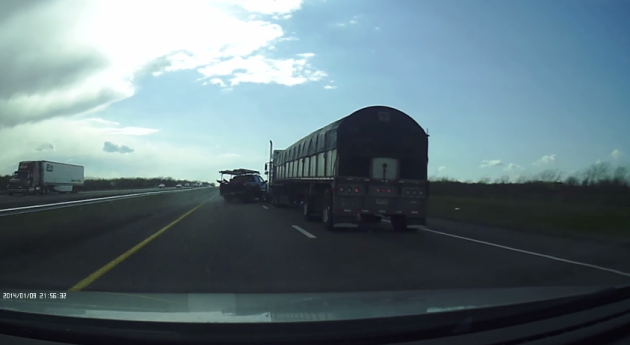 Then he merges back into traffic a bit too soon, colliding into the work truck, sending both vehicles sprawling into the tanker, and forcing all three of them off of the highway. According to police, the Camaro driver—Kiran Thapa, of Columbus, Ohio—had a blood alcohol content of .19 percent. He was charged with DWI and driving without a license. If we’ve said it once, we’ve said it a million times: drunk driving and road rage are two not great tastes that taste not great together.